Good luck getting into Professor Yoav Freund’s big data analytics and Spark class at the University of California, San Diego this fall. “There’s always a very long waiting list to get in,” he says. But thanks to a new partnership between UCSD and EdX, anybody can take the same course online for free. On September 3, UCSD will start its second round of MicroMasters classes with EdX, which was created by Massachusetts Institute of Technology and Harvard University in 2012 to provide online duplicates of popular classes at major colleges and universities around the country. While about 400 lucky UCSD students will make it into Professor Freund course, there will be anywhere from 20,000 to 30,000 people signed up for the same class on the MicroMasters program (although only around 1,000 will actively participate). Massive open online courses (MOOCs) are nothing new. Stanford Professor Andrew Ng helped launch the MOOC movement with his machine learning course, which once attracted more than 100,000 attendees. Ng went on to co-found Coursera with fellow Stanford professor Daphne Koller, and today it offers 2,700 courses and four degrees, including a Master’s of Applied Data Science offered in conjunction with Michigan State. The idea is to expand the number of people who can access to the master’s level curriculum and courses. The past year, about 600 people applied for the Master of Science in Data Science program, but only about 70 people were enrolled, according to this August 22 UofAToday story. While only about 30 people will be admitted to the online MSDS course, the numbers are expected to increase in the years to come. “We are excited to expand access to our M.S. in Data Science to meet growing demand,” Phil Bourne, director of the Data Science Institute, says in the story. Data science education continues to evolve at places of higher learning, including an expansion in the number and type of degrees. Two colleges in Tennessee, Vanderbilt University and Middle Tennessee State University, recently launched data science institutes with the goal of creating a master’s-level degree programs, according to the Nashville Post. Earlier this month, Clarkson University announced the creation of a new bachelor’s-level data science program. The program, which ramps up on the New York university’s campus in the fall of 2019, will focus heavily on math, statistics, and computer science. Tufts University is also ramping up a new MS in Data Analytics degree program, which will also enroll its first students in the fall of 2019, according to this story in TuftsNow. UCSD added a bachelor’s of science degree in data science last year, and has offered a master’s level continuing education program for the past three or four years. “For the master’s level, there isn’t yet an official degree,” Professor Freund says. “At some point, we definitely want to have a graduate program,” most likely a master’s program and not a PhD. While demand for data scientists is exploding, it’s largely an inter-disciplinary sport at many universities, crossing colleges of math, computer science, and business – and sometimes even humanities (at Tufts). Many universities are creating their own data science degree programs, but there’s some debate as to whether it has the weight to stand by itself. 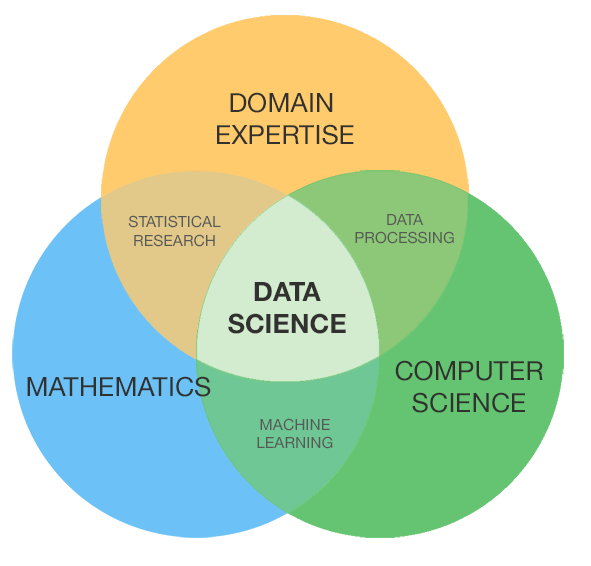 In the classical Venn diagram, data scientists possess three overlapping sets of skills: math and statistics, computer science, and business expertise. While the math and computer skills can typically be taught at universities, it’s the third area – expertise in solving real-world business problems – that is often the toughest to come by. That’s leading to an expansion of data science and analytics courses in Master’s of Business Administration programs too. MBA programs at UCSD, University of Michigan, and UofVA each offer analytics concentrations for their business-focused programs, according to this story on the Find MBA website. While folks can ostensibly get trained in all three data science disciplines as defined by the Venn diagram, there are some who say that data scientists simply cannot be minted from colleges, and must be hardened through experience in industry. “I still maintain that a pure unicorn data scientists can’t come out of a university with decades of subject matter expertise and deep and broad statistical knowledge and the ability to build software at scale,” Cloudera Chief Information and Data Officer Amy O’Connor told Datanami recently. By contrast, those entering data science from a more science-oriented program are more apt to have the statistical background that a classic data scientist should have, she says. “I think the core data science curricula isn’t quite hitting it yet. They need to break it down a little bit more,” she says. As the core curricula around data science gets hammered out, people may consider cross-training as a good way to ensure one’s skills are suitable for real-world jobs in data science. O’Connor recommends that folks who have software engineering skills can benefit from taking math and stats courses, while those with PhDs or master’s in math and stats could do well to take programming courses. Regardless of which approach one takes, demand for those with data science skills will continue to increase as data volumes mount. According to Glassdoor, the average data scientist earns $120,000 per year. With 215,000 job openings for data scientists, according to Indeed, the data scientists role will continue to have good job protection nationwide.